"An Easter cupcake with a surprise egg inside." Preheat oven to 350 degrees F (175 degrees C). Grease 24 muffin cups, or use paper liners. Sift together the flour, baking powder and salt. Set aside. Cream together the margarine, brown sugar and white sugar in a large bowl until light and fluffy. Beat in the eggs one at a time, then stir in the vanilla. Beat in the flour mixture alternately with the milk, mixing just until incorporated. Fill each muffin cup 1/3 full, and place a chocolate egg in the center of each. Top with remaining batter until cups are 2/3 full. Bake in preheated oven for 18 to 20 minutes, or until golden brown, and tops spring back when lightly tapped. 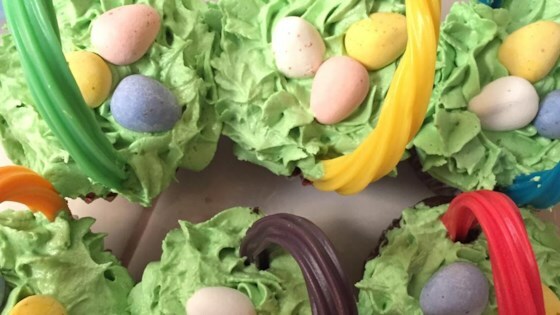 Watch how to create these adorable Easter bunny cupcakes! These were fun to make with the kids. We decorated the cupcakes to look like "baskets" using licorice sticks for handles, green coconut for grass, and mini peanut butter eggs! The cupcakes were great but the chocolates melted right through the bottom. My kids thought these cupcakes were great. I enjoyed them too. Great for anytime, not just Easter. These were really good. I used mini-marshmallows to make bunnies decorations. Really fun for Easter. these were spectacular! !..followed recipe exactly as described, but after they cooled I iced them with duncan hines frosting....YUMMMM!